Hi guys! Hope all is well. I am sorry I was very busy last week with work and home and did not get a chance to participate in the weekly desk-hopping fun! Today I am sharing what is on my work desk with you. 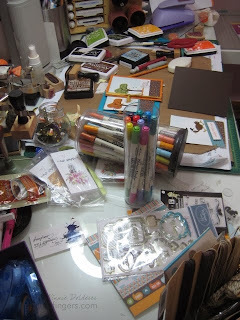 Be prepared, as it is very messy and full of inky fun! Since tomorrow is Thanksgiving here, I am trying to make a few cards for family and friends. Nothing like last minute crafty time! You may notice that I dug out my Distress Markers, Distress Inks, Archival and Hero Arts inks. Such an inky desk today. Thank you to Julia for hosting this weekly desk-hop! I hope to visit with as many of you as I can while I prepare the house to get ready for tomorrow's Thanksgiving holiday! THANKS for the cards. Letter coming! Hello..fabulous inky desk...love it...wonderful space to work on..,fantastic picture...so many beautiful and dazzling treasures I'd love to jump in and create with. Love those markers..they look super-fun! Happy Creating..thanks for your kind visit! Enjoy your TG wkd! I love making cards for family members during the holidays too. However,we're having a quiet Thanksgiving in town this year, with my wife, high school daughter and our oldest daughter who is coming in today from college. Yeah! By the way, I have more information on the Hina dolls, as well as an link to where I got it, on my Tag Tuesday post. You can find it on the address below. Have a blessed Thanksgiving day with your family, my friend! What lovely cards, Winnie. I trust you and your friends will have a very special time for thanksgiving. We, many years ago, were in Canada for their thanksgiving - a really unique experience for us, as we do nothing like this here in Wales. Thanks for visiting earlier - we must see what social services say about a stairlift - but they really are fun! hope hubby gets one. Yes your desk is full of ink pads and looks all up and ready to make more cards.Many blessing for a Happy Thanksgiving Be well Carole # 67...I think I was 67 last week too! better late than never as they say. Cards are fun! Love your very inspiring desk!! Love it. Looks like how it was here as I was doing my Christmas cards.